Fallen cycling champion, Lance Armstrong, the founder and chairman of cancer-fighting Not for Profit LIVESTRONG, has stood down as chairman of the organisation’s board of directors. In a statement released by the organisation Armstrong said:” In order to spare the foundation any negative effects as a result of controversy surrounding my cycling career, I will conclude my chairmanship." However Armstrong says he and his family will continue to support the work of the Foundation. The decision comes as the LIVESTRONG Foundation is about to celebrate its 15th anniversary. “In 1996, as my cancer treatment was drawing to an end, I created a foundation to serve people affected by cancer,” Armstrong said in his statement. “It has been a great privilege to help grow it from a dream into an organization that today has served 2.5 million people and helped spur a cultural shift in how the world views cancer survivors. This organization, its mission and its supporters are incredibly dear to my heart. “I am deeply grateful to the people of the foundation who have done such hard and excellent work over the last 15 years, building tangible and effective ways to improve the lives of cancer survivors. And I am deeply humbled by the support our foundation has received from so many people throughout the world – survivors, world leaders, business leaders and of course, the cancer community itself. “I have had the great honor of serving as this foundation’s chairman for the last five years and its mission and success are my top priorities. “My duties will transfer to Vice Chairman Jeff Garvey who will serve as chairman. Jeff’s guidance and wisdom have been critical to shaping the foundation’s work since its earliest days. Jeff was this organization’s founding chairman and I have full confidence that under his leadership, the foundation will continue expanding its ability to serve cancer survivors. LIVESTRONG President and CEO, Doug Ulman, responded saying: “Long before he became a household name, Lance Armstrong created a foundation to serve others facing the same fears and challenges he struggled to overcome as a result of his cancer diagnosis." “Today, thanks to Lance’s leadership, that foundation has had the privilege of raising close to $500 million to serve people affected by cancer." In June the Foundation came to his defense after revelations the U.S. Anti-Doping Agency (USADA) is levelling formal charges against him for distributing and administering drugs. In recent weeks the United States Anti-Doping Agency released a report containing accusations of widespread doping by the seven-time Tour de France winner Armstrong and his teams. It contains sworn statements from 26 witnesses, including 11 former team-mates. 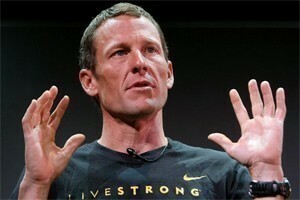 Armstrong is now set to lose all his titles.